Activator Methods will respond to your request. PHOENIX, AZ, July 5, 2018 – Activator Methods International has been featured in the Quarterly World Report published by the World Federation of Chiropractic. It is with great pleasure that we send you the July issue of the WFC’s Quarterly World Report. Again, we have included not just stories about the activities of the WFC – which are impacting positively on the profession globally – but also reports on the tremendous work being performed by doctors of chiropractic around the world. As always, we appeal to you, our readers, to tell us about what’s going on in your country, state, province or region so that we can share your good news far and wide! Whether it is the outstanding work of an individual chiropractor or a project coordinated by a national association, let the WFC know about it! In the meantime, please enjoy this July issue. Activator Methods International® is home to the full line of Activator® instruments and the ActivatorMethod® of chiropractic instrument adjusting. Founded on the principles of clinical research, Activator Methods International has been providing chiropractic care, resources, and training since 1967. For more information please visit www.activator.com. PHOENIX, AZ, November 30, 2017 – Activator Methods International has been featured on the front page of the Chiro-Times. 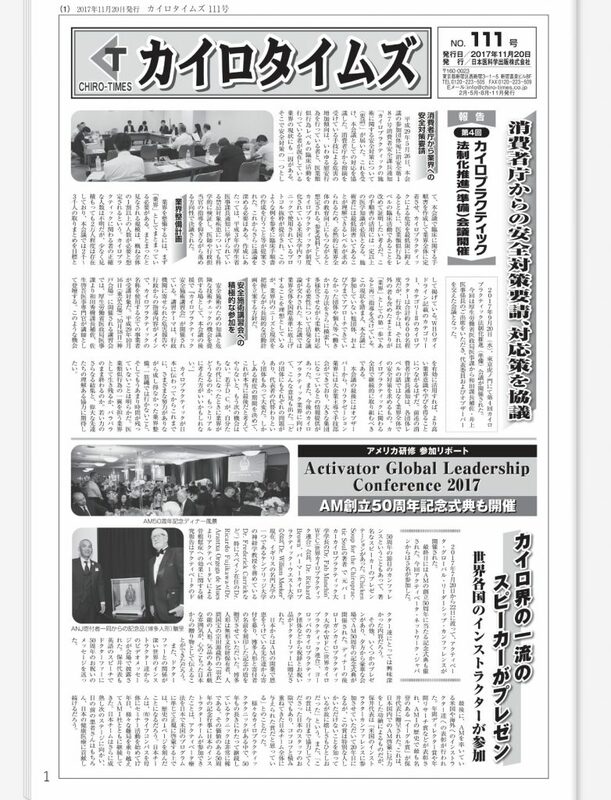 The article highlights Activator Method’s recent 50th Anniversary Leadership Conference. Activator Methods Internation is honored to have been chosen for a front-page feature on this popular industry newspaper. PHOENIX, AZ, October 16, 2017 – Activator Methods International® is excited to announce a once-in-a-lifetime opportunity to learn from Dr. Arlan Fuhr and Dr. James Cox during the Activator and Cox Master Class at the Sheraton Maui Resort & Spa in Hawaii on February 3-4, 2018. Dr. Arlan Fuhr and Dr. James Cox will be training on their adjusting techniques as well as sharing their years of experience treating patients and revolutionizing chiropractic care. They are the founders of the two out of the top three adjusting methods used in chiropractic today — Activator Methods International® and Cox Technic, respectively. Attendees will be immersed in first-hand training, engaging stories and conversations around the future of chiropractic care, adjusting techniques, and innovative technology, all drawn from the more than 100 combined years of chiropractic experience, education and leadership from Dr. Fuhr and Dr. Cox. Dr. Fuhr will be speaking to Activator proficiency rated doctors about the latest research, including a brand new study on osteoporosis. Dr. Cox will give an honors level presentation with a focus on Cox Technic’s latest biomechanical and clinical research outcomes with an emphasis on the post-surgical continued pain patient and its practice integration via case reports and treatment demonstration with The Cox8 Table. “There’s a reason why these techniques have survived for more than 50 years, and they have the research track record to back them up. This is a rare opportunity to interact with and learn from the remaining two founders,” said Dr. Fuhr. attendee and is now open. F/D Enterprise LLC is the home of Cox® Technic training with The Cox8 Table®, research coordination, and referral network. The Cox® Technic System of Spinal Pain Management has evolved over the past 55 years based on the desire for science, documentation, and dissemination of biomechanical and clinical research of chiropractic care to produce optimal patient outcomes. For more information please visit www.coxtechnic.com. To register for the Activator & Cox Master Class, visit activator.com/maui or call 1-800-441-5571. For more information, please contact Customer Service at cservice@activator.com. 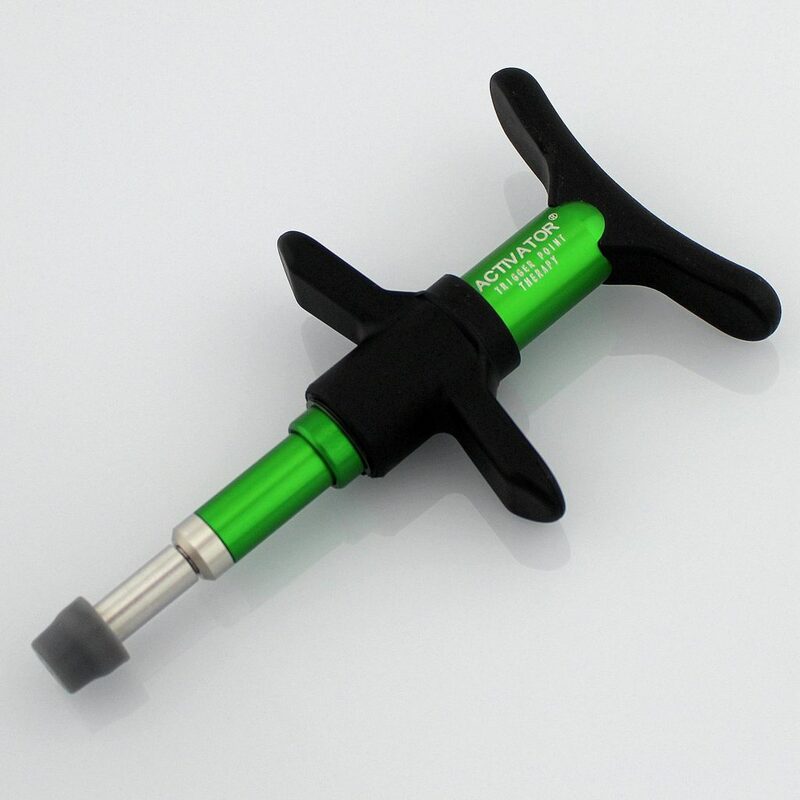 (PHOENIX) – Activator Methods International® (AMI), the industry-leading creator of the world’s most popular chiropractic adjusting instruments, announced today that its new Activator TPT® (Trigger Point Therapy) instrument is now available for sale in the United States. The instrument, designed exclusively for use by massage therapists, is the first of its kind on the market. Activator TPT is lightweight, with an advanced design that offers the massage practitioner the ability to apply precisely the right pressure to loosen the tight, painful muscle spasms also known as ‘trigger points.’ The force is pre-set at the factory, so while it cannot move a bone (like a chiropractic instrument) it is perfectly tuned for the massage therapist. 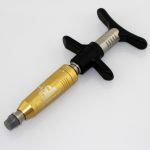 Peer reviewed literature shows the instrument provides pain relief seven times faster than the typical thumb pressure. $159.99, massage therapists can now bring the science of Activator into their daily practice. Activator Methods International® is home to the full line of Activator® instruments and the Activator Method® of chiropractic instrument adjusting. Founded on the principles of clinical research, Activator Methods International has been providing chiropractic care, resources and training since 1967. For more information please visit www.activator.com. (PHOENIX) – Activator Methods International® (AMI), the industry leading creator of the world’s most widely-used chiropractic instrument adjusting method, is pleased to announce the release of a special commemorative version of its highly popular Activator IV and Activator IV EZ Grip adjusting instruments. These exclusive, limited-edition instruments have been created to honor the landmark 50th Anniversary of The Activator Method. Fifty years ago, back in 1967, Dr. Arlan W. Fuhr was a young chiropractor in pain. After long days adjusting patients using the Van Rumpt technique, he found himself soaking his arms in ice to relieve intense discomfort caused by snapping his elbows together to produce the force needed to adjust his patients. He set his sights on solving that problem. The result was the Activator Method of chiropractic adjusting, along with the very first Activator Instrument. What Dr. Fuhr couldn’t have predicted was the astounding success of the invention. In the 50 years that followed his initial insight, Activator has become the gold standard of instrument adjusting and is used daily by more than 70% of chiropractors worldwide. Patients often specifically ask for Activator adjustments because the technique is safe and doesn’t require twisting motions or manual force to complete adjustments, particularly of the neck. The instrument and method have been the subject of 23 clinical trials and more than 150 scientifically reviewed papers supporting its safety and effectiveness. The Activator Method is part of the core curriculum in 18 colleges of chiropractic in the United States, as well as in 31 colleges and universities overseas. Every year, Activator presents dozens of training seminars in the U.S. and overseas, and offers its self-paced Basic Scan Protocol via the web through its Activator Online course. Only a small number of the 50th Anniversary instruments have been produced and offered for sale. There will not be a second manufacturing run, making the instruments truly collectible. (PHOENIX) – Dr. Arlan W. Fuhr, co-founder and chair of Activator Methods International® (AMI), the industry-leading creator of the world’s most popular chiropractic adjusting instruments, shared his experiences and concerns about the significant overprescribing of opioid medications. Dr. Fuhr’s comments were made during an interview on “The Dr. Bob Martin Show” on KFYI News Talk 550 AM, which broadcasts in the Phoenix area. During the conversation, both doctors discussed the tragic consequences of overuse and abuse of opioids. In testimony before the U.S. Senate in 2014, the National Institute on Drug Abuse (NIDA), a component of the National Institutes of Health (NIH), indicated that in 2012 an estimated 2.1 million people in the U.S. were dealing with substance abuse disorders related to these drugs. Evidence also suggests a growing relationship between opioid abuse and heroin. To listen to the full program including the interview with Dr. Fuhr, please visit http://kfyi.iheart.com/media/play/27739117/. 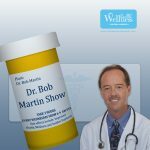 The host of the interview, Dr. Bob Martin, is a chiropractor and clinical nutritionist who is board certified in anti-aging medicine. He believes information and education are the keys to good health, and takes every opportunity to share his knowledge through consumer lectures, newspapers and radio health talk programs throughout the United States and Canada. “The Dr. Bob Martin Show” can be heard on KFYI radio in the Phoenix area on Saturdays from 10am-12pm and on KFYI 2 on Sundays from 6a-9a. 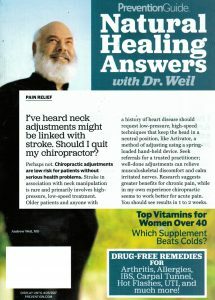 Once again, Dr. Andrew Weil points to Activator’s safety and effectiveness. Feel free to print and share with your patients! (PHOENIX) – Activator Methods International® (AMI) is pleased to announce that 2017 marks the 50th anniversary of the invention of the Activator Method technique and the innovative development of the Activator adjusting instruments. The Activator Method, and later the Activator Adjusting Instrument was invented in 1967 for one simple reason: Dr. Fuhr was in pain. As a new, young chiropractor trained in the Van Rumpt technique, he was adjusting a high volume of patients using a thumb thrust generated by bringing his elbows together with quick force. The work took its toll; Dr. Fuhr soaked his sore arms in hot water in the morning and iced them at night, just to keep the pain under control. In the quest to find the right solution, Dr. Fuhr created the Activator Method of chiropractic adjusting and, later, the Activator adjusting instrument. This innovative device delivered a consistent, gentle thrust that – when used properly by a trained practitioner – provided an adjustment equivalent to manual manipulation. In the years since, the instrument and its associated method have produced 23 positive clinical trials and more than 150 scientifically reviewed papers supporting its safety and effectiveness. Fifty years later, the Activator Method is now the world’s most popular instrument adjusting technique, used by 70% of clinicians globally. There are now thousands of Activator instruments in use, including the Activator V – the world’s first fully electronic, cordless adjusting instrument. Every year, Activator presents more than 75 training seminars throughout the United States and internationally. Additionally, AMI provides online training in the Basic Scan Protocol, the cornerstone of the Activator Method, through Activator Online (www.activatoronline.com). The Activator Method is part of the core curriculum in 18 colleges of chiropractic in the United States, as well as in 31 colleges and universities overseas. Activator will celebrate its 50th Anniversary formally with an invitation-only gala in July 2017. Also in honor of the anniversary and beginning immediately, doctors and students may take advantage of special reduced seminar rates. Please visit www.activator.com for more information. All New One Day Seminars! (PHOENIX) – Activator Methods International®, the pioneering creator of the world’s most popular chiropractic adjusting instruments, has announced a set of major innovations to its successful seminars presented in the United States and abroad. Beginning in January 2017 seminars will now be taught in one day, empowering busy doctors to improve the level of care they provide patients while reducing the time away from their practice and their families. These new classes are streamlined, and now offer a more focused and effective learning experience. In addition, participants who complete the new, lower-cost seminars will still be eligible for eight hours of Continuing Education credits available through Palmer College of Chiropractic and may test for an Activator Proficiency or Advanced Proficiency rating. Until now, Activator seminars had been taught in a 1.5 day format that – in many cases – made an overnight stay a necessity and asked doctors to forfeit a whole weekend for the sake of their professional development. Activator seminars teach the latest, research-based Activator curriculum, with an emphasis on practical, real-world, hands-on advice and expertise. Led by Advanced Proficiency Rated doctors with years of clinical practice experience, Activator seminars tracks cover Fundamentals (the Basic Activator Protocol), Instrument Adjusting for Extremities and Clinical Topics. The updated classes also come with a lower tuition price tag: doctors may attend for $350, new doctors for $99 and – in honor of Activator’s 50th anniversary in 2017, students may attend for just $50. The Activator Method is the most widely used low-force adjusting technique in the world, with thousands of doctors in the U.S. and internationally holding a Proficiency or Advanced Proficiency Rating. Activator has been the subject of 23 clinical trials (and is the only adjusting instrument with clinical trials), and has more than 150 peer-reviewed research articles to its credit. Dr. Fuhr knows what it’s like to have a small part in something big. The early 1970s were a pivotal time in Logan’s history, and the decision of whether or not the institution could move operations to a 112-acre property in Chesterfield rested in the hands of Logan alumni. Dr. Fuhr, having been in practice for just 10 years, was one of 70 alumni who donated $5,000 to raise $350,000 needed for the down payment of the current campus. Nearly 40 years later, he still considers that donation as one of the more defining moments of his career. “You never lose anything by giving,” he said. Dr. Fuhr was only 12 years old when he identified his calling to become a chiropractor. After years of suffering from painful sore throats, Dr. Fuhr began receiving routine adjustments from his mother’s chiropractor. Within 11 visits, the sore throats were gone, and Dr. Fuhr had a clear vision of his career path. Today, Dr. Fuhr is the co-founder and inventor of Activator Methods International, a Phoenix-based company known for the instrument adjust technique, the Activator Methods, which provides chiropractic care, resources and training. He also continues to leave his mark on the institution that he says gave so much to him. 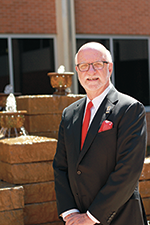 The September 1961 graduate is chair of the new Forever Chiropractic, Forever Logan campaign – the first perpetual and permanent scholarship campaign that benefits current and future Logan chiropractic students. “What I like about the program is that half of the money is allocated for immediate scholarships, while the other half is earmarked for scholarship endowments,” he said. That means the principal gift remains in perpetuity, while income generated from the endowed portion supports future scholarships. To kick-start the campaign, Dr. Fuhr has committed to giving $50,000 ($5,000 a year for 10 years). He encourages colleagues and supporters to learn more about the Forever Logan campaign and consider donating at least $1,000 or more each year for the next 10 years. Visit logan.edu/Forever to learn more. Chairman & Founder Activator Methods International Ltd. ACTIVATOR, ACTIVATOR METHODS and the ACTIVATOR logo are registered trademarks of Activator Methods International, Ltd. and may not be used without prior written permission. Are you a Chiropractic Professional or a Patient Looking for an Activator Methods Doctor?